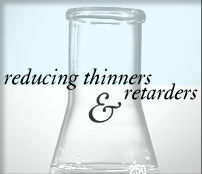 Reducing Thinners and Retarders: G.J. Nikolas & Co., Inc. Picking the right thinner for your coatings is important to insure maximum coverage, appearance and durability. Using a low cost or miss-matched thinner will increase your production cost and possibly cause costly rejects and field failures. Nikolas thinners are engineered to give optimum flowout and highest spray solids at the correct spray viscosity. Use Nikolas retarders to prevent blushing in humid weather. They are concentrated so a small amount will stop moisture from condensing in your lacquer and spoiling a good job.